The challenge aimed to find good but affordable wines and to involve consumers in the process. Judging was done by teams of 6 consumers and 6 experts. The consumers team were asked to rate each wine as 'love it', 'like it', 'dislike it' or 'hate it'. 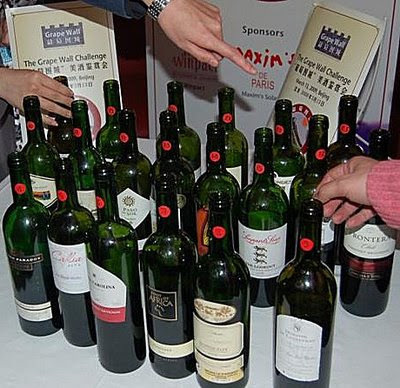 The experts panel included wine makers and lecturers who used the 20 point scale to score wines. The experts gave 9th place to the Pinotage, but when the two teams scores were combined Foot of Africa Pinotage was in third place. Read the full report here. Thanks to Jim Boyce of grapewallofchina.com who organised the tasting for permission to use these photographs. Pinotage expert Angela Lloyd has been tasting 96 varietal and 24 Pinotage blends for WINE magazine and she’s blogged some interesting thoughts in Grape.co.za on where Pinotage is today. She also has some words for coffee Pinotages which she calls a “cynical recipe” for “coffee masquerading as wine”. Reyneke's Pinotage is "Another classic"
"I also hugely enjoyed Johan Reyneke’s superb Pinotage 2005 (£12.50), again biodynamic, a deep ruby red from Stellenbosch in South Africa, with a gorgeous smell of creamy black cherries and plums, chocolate and spice and then backed up by silky smooth tannins. Another classic." -- Helen Savage, writing about ethical trading in Newcastle's The Journal on 13 March 2009 . I am delighted to learn that Reyneke's Pinotage is available in the UK. 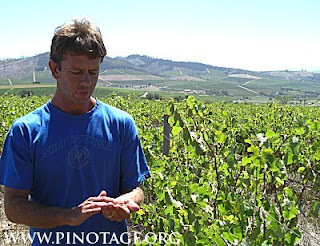 Johan Reyneke, pictured above, was the first farmer in South Africa to convert to Biodynamism and it was his Pinotage vineyard that was the first. The results from that trial were so impressive that he turned went competely over to biodynamic farming. Almost the entire entire production from that small Pinotage vineyard has been earmarked by US customers, so much so that Johan was hard pressed to find one bottle for me when I visited him. But the 2005 vintage is [UPDATE = NO LONGER] available from Ethical Superstore at http://www.ethicalsuperstore.com/products/ethical-fine-wines/reyneke-pinotage-stellenbosch-south-africa/ at £12.50 a bottle. Despite the wine still being listed as "In Stock. Available for despatch tomorrow" and accepting an order from me for 6 bottles, it seems they have only one bottle in stock A brief phone message was left with someone else in my house that "the Stellenbosch wine" is unavailable. They could not tell the name of the wine and since I have a number of wines on order it wasn't until a got an abrupt email from them saying "Order Status:Cancelled" that I knew. There was no apology, no nothing, just "Order Status:Cancelled". Ethical Superstore was set up in 2006 by Vic Morgan and Andy Redfern with the manifesto help the ethical consumer “Buy What You Believe”. A three part series on wine came to an end last night with the final programme titled ‘The Future’ focusing on two South African wine brands, M’Hudi and Solms-Delta. The programme irritated me from the start because they mispronounced Pinotage and called it “a hybrid varietal that remains stubbornly unpopular abroad”. The programme tried to create suspense with the annual visit of Marks & Spencer’s wine-buyers and whether would buy M’Hudi’s Pinotage. M&S already stock the other two M’Hudi wines, Sauvignon Blanc and Merlot and the chances of taking a third, bearing in mind another wine in M&S’s portfolio would have to be delisted, are almost non-existent. But there were no surprises since we already know that M’Hudi’ s Pinotage is not in M&S. There was no discussion of why no other buyers than M&S was considered. Initially the two farmers seemed to be on opposite ends of the spectrum. M’Hudi is the first black owned vineyard, bought by the Rangaka family who live in a ramshackle tin-roofed cottage among broken machinery and straggling bush vines while Solms Delta has been in the same family for generations who live in a grand Cape Dutch mansion among a landscaped garden and neat trellised vines. At the IWC M'Hudi Pinotage got a Bronze medal whiled Solms-Delta's lambrusco like wine failed to win anything. Oupa Rangaka seemed a little restrained on the programme, but maybe there just wasn't enough time to show him in full speech mode! To London for the first time for more than four months for a tasting of Top End Blends organised by WoSA. What strikes me is just how expensive SA wines are getting. £36 for a Merlot blend? £17 for Nederburg's blend of eight white varieties, the sort of thing that Flagstone used to do in a £5 Noon Gun? Several of the reds have a Pinotage element, but I’ll concentrate on those that have a least 30% Pinotage as per Cape Blend conventions and I’ll list them in descending order of Pinotage proportions. Cloof Inkspot Vin Noir 2005, (Darling) 14.83%abv. 78% Pinotage, 12% Shiraz, 10% Cinsaut. Middlevlei 2006 (Stellenbosch) Middlevlei pioneered this blend of equal shares of Pinotage and Merlot and 14%abv. has equal shares of Pinotage and Shiraz. 15.28%abv. Kaapzicht Steytler Vision 2005 (Stellenbosch). 50% Cabernet Sauvignon 40% Pinotage, 10% Merlot 15.1% abv. Lyngrove Shiraz Pinotage 2004, (Stellenbosch). Dekkers Valley Revelation 2004 (Paarl). I rated Kaapzicht and Middlevlei the best of the bunch, but the discovery of the tasting was Dekkers Valley, second label Mellasat, which offered a really enjoyable drink at the lowest price point.